Okay, so for me, it’s still not sit-down-and-make-Christmas-Cards time yet, but I suppose, by the time I finish showing you lots of different styles, I will have made enough anyway…. But today, I wanted to share one with you. 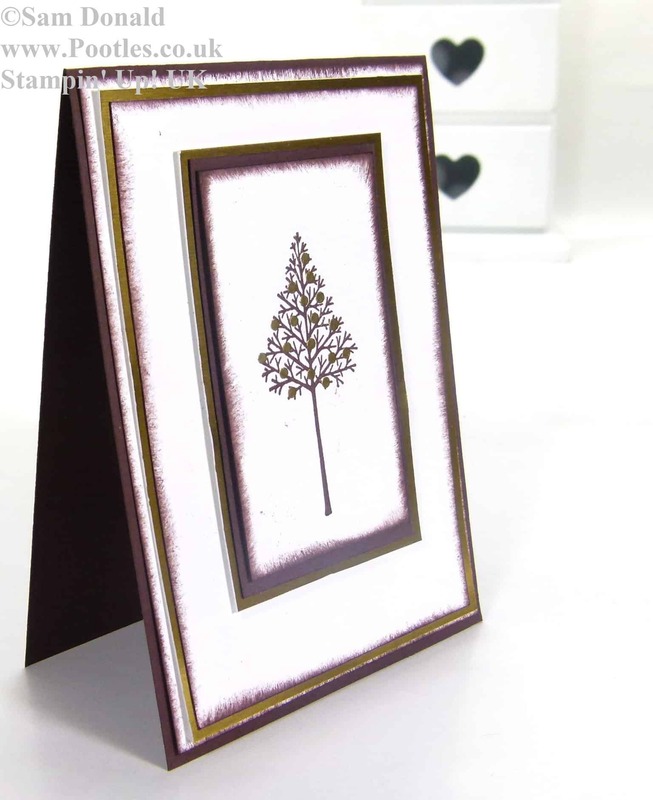 A simple card, but elegantly old fashioned, but not in a twee or dated way. I loved the Warmth and Wonder hostess stamp set from the second I saw it. It’s so pretty, and has some really clever images in it, which as you can see from the tree and the baubles, these are designed to layer over one another. I don’t know why I decided to use Chocolate Chip and Gold. There wasn’t a particular train of thought that took me in that direction, and as I’m a very instinctive crafter, I don’t plan a project particularly, I just let it evolve, I ended up with this! The Gold Foil Sheets from the seasonal catalogue are absolutely stunning, and my goodness they have a beautiful finish to them. It’s not that dreadfully shiny ‘mirror’ card that you’ll often see, but a slight hint of dullness to them that stops them being so very 1990s! So essentially, this card is just about layers. 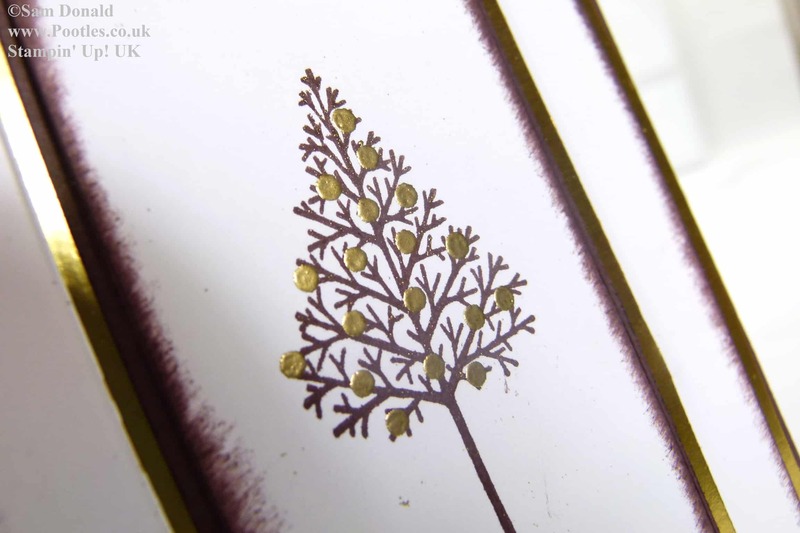 Layers of Chocolate Chip Cardstock, Whisper White Cardstock and that stunning Gold Foil. 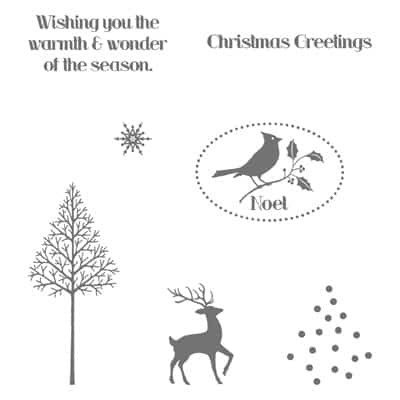 I almost feel as though the stamp is an afterthought, but adding the ‘baubles’ on with Gold Embossing Powder has meant they step up and off the card too! Well, this stamp set is only available as hostess benefits. You get these if you have an order over £150, or if you’re part of a group of orders that club together and total over £150, and then you get free hostess £££s to spend, and access to the lovely hostess exclusive stamp sets. I love this one, it’s quite possibly one of my favourites to date! And I hope you like it too!